If this is starting to look like 2013 and 2014 all over again, well, it's half way there. ST. LOUIS -- Coming home to their fans, who continue to support them no matter what and holding a 2-0 series lead against the Winnipeg Jets, the Blues, at the very least, needed just one triumphant result out of Games 3 and 4 to put a stranglehold on the Western Conference first round series. The Jets came into Enterprise Center and made it a best-of-3 series after Kyle Connor scored 6 minutes, 2 seconds into overtime to cap a 2-1 Jets win on Tuesday to even the best-of-7 series 2-2. Game 5 returns to Winnipeg's Bell MTS Place on Thursday. Instead of, if Doug Armstrong's famous comment of "You need to take the knife and jam it through their eye and into their brain and kill them. We don't do that," that's been famously used over and over on talk airwaves when it comes to the Blues, is beginning to fit the bill again. For the third time in seven seasons, the Blues took a 2-0 series lead. In 2013, they did so against Los Angeles before losing in four. They did it again the following season against Chicago, only to lose in six games again. One game would have put the Blues in prime position to advance. Now they have to try and steal another one in Manitoba. "It's frustrating," Blues defenseman Alex Pietrangelo said. "We knew it was going to be a hard series, right? We took two in their building so regroup and hopefully steal another one in there." The Blues did what they needed in gaining the early lead in the series by winning Games 1 and 2, 2-1 and 4-3, in Winnipeg. But just as they took control in Winnipeg, they gave it right back to the Jets with a dud in Game 3, followed by a much more competitive game on Tuesday but as has been the case in recent playoff history, found a way to lose again. "It's obviously tough for sure," Blues interim coach Craig Berube said. "But again, it's a tight series. Two good teams. Could've went either way. Goalies are good." The Blues were looking for a better start, something that's been lacking in this series for them, and got just that. They gained the Jets zone, had sustained pressure and got the first eight shots on goal. The problem was, no results. It was 0-0, and Winnipeg's game grew as things moved along. Berube liked his team's start. "I thought we had a good start," Berube said. "I thought they were ready, too. They looked good. They had good jump, too. It was a pretty even hockey game. We've got to do a better job of ... they had a few shifts where they had too much time in our end and got some opportunities there. We gotta do a better job of closing it out a little quicker and making a play and getting out of our zone. There were too many times when we just dumped it back out to 'em. Can't get a line change and they're back in on us. "They're a good team. They play fast and they're big." Who was going to break the barrier first? That was the key question, as goalies Jordan Binnington and Connor Hellebuyck were both holding the fort. And it was Vladimir Tarasenko, whose power-play goal 35 seconds into the third gave the Blues a 1-0 lead. His goal from the left circle, a wicked wrister over the glove hand of Hellebuyck, sent the crowd into a frenzy. It was the kind of game that smelled one, two, three goals tops. This one had 1-0 written all over it. But the Blues' game changed. Why? Nobody knows. But the Jets gained momentum, they were hemming the Blues in their zone, forcing turnovers, Blues skaters weren't getting pucks cleanly out, getting deeper clears, allowing the Jets to recoil and go on the attack again. "They had some chances. I think we got away from it a bit in the third," Pietrangelo said. "I think both teams controlled parts of the game. It would have been nice to close it out but again, it's an overtime game, it could have gone either way. Have to find a way to regroup for Thursday." Why get away from it, though? "Just a little passive, defensive," Pietrangelo said. "I think we're better when we're aggressive." The Jets would get the predictable equalizer when Mark Scheifele, who helped set up Connor's game-winner, went hard to the net out of Oskar Sundqvist's reach and was able to redirect Connor's pass to the slot into the top corner at 7:33 of the third to make it a 1-1 game. The Jets would continue to push, outshooting the Blues 15-7 in the third period, and that's even with the Blues getting one last crack at a power-play goal with 3:41 to play when Mathieu Perreault was called for tripping, his second penalty of the night. But the Blues looked too predictable and managed only one shot, and on to overtime they went. "We only the one look really," Berube said. "But we could've attacked more on that power play and did a better job. But it just didn't happen." And really, it got to overtime because of Binnington, who rebounded with a 37-save effort, including some 10-bell saves that gave the Blues a chance. The fans were in such appreciation, they began in the third period to chant "BINN-ING-TON!" "That was a pretty cool moment obviously, but I'd rather win," Binnington said. "... I felt all right. Not the outcome we wanted so I've got to be better." Winnipeg outshot the Blues 5-1 in overtime and got the winner when Scheifele got Colton Parayko turned around as he burst into the Blues zone. 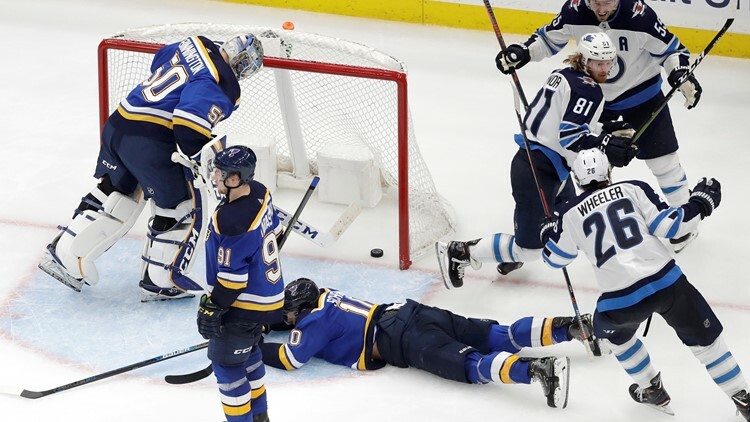 Binnington made the initial save on Scheifele, but the rebound popped to his right, where Blake Wheeler was able to get to the loose puck, slip it into the crease where Connor came in uncontested and tapped in the winner. "It's a sense of relief, a lot of excitement," Connor said. "There's nothing better than to celebrate with teammates all coming in there." "I can't really remember exactly," Binnington said of the goal. "I remember a shot from the right side, the rebound was there, he passed it out front, and it went in. "It's playoff hockey. Stuff happens and it's how you handle it. Just prepare for the next game in Winnipeg." Robby Fabbri made his playoff debut Tuesday and finished with 9:19 ice time and four hits.